Ugh.........do u think DeiDei & Itachi-san r hot?! oooooooooooo november_snow, thanks for the pic!!!!!!!!!!! wow and he's smileing...he's dilusional!GET HIM 2 A HOSPITAL!HE NEVER SMILES!!!!!!!!!!!!!!! cause i like madara w/ the long spikey hair tho...i just think its better suited 4 em..
Madara grew up in constant competition with his younger brother, Izuna Uchiha who were both known as the most gifted members of their clan. Their competition led to both gaining the Mangekyo Sharingan, and with it they were able to take control of the Uchiha clan, Madara acting as its leader. Even by his clan's standards, Madara's chakra was unusually strong. 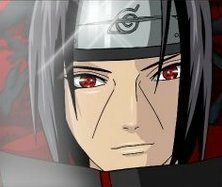 Under his leadership the clan conquered all they came across, but overtime he began to lose his sight because of the Mangekyo Sharingan. To regain his vision he took his brother's eyes (an act Madara says his brother consented to), allowing him to continue to lead the Uchiha to prosperity. 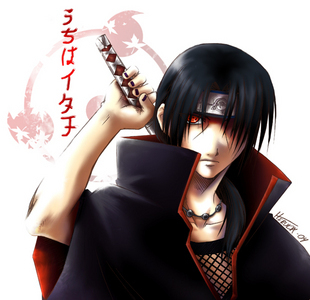 In the years that followed, the Uchiha constantly clashed with the equally powerful Senju clan. To bring an end to the continued fighting, the leader of the Senju, Hashirama Senju, approached Madara with an offering of peace. Although Madara never wanted peace with the Senju, the rest of the Uchiha wanted to end the fighting and Madara had no choice but to go along with their decision. The Senju, the Uchiha, and all the clans they had conquered came together to form the village of Konohagakure. Against Madara's wishes, the villagers selected Hashirama as the village's First Hokage. 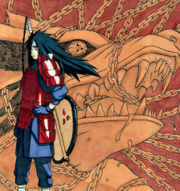 Madara feared that Hashirama would oppress the Uchiha and tried to rally support for challenging his leadership. Rather than help him, however, the Uchiha turned their backs on him, believing his only motives were greed. Madara's statue at the Valley of the End.Abandoned by his clan, Madara left the village so that he could return to challenge Hashirama in battle. They fought at the site that would someday be called the Valley of the End where, although Madara called upon the Nine-Tailed Demon Fox, he was defeated and believed to have died. Madara faded into memory, and in time would found Akatsuki and become Kirigakure's Mizukage. 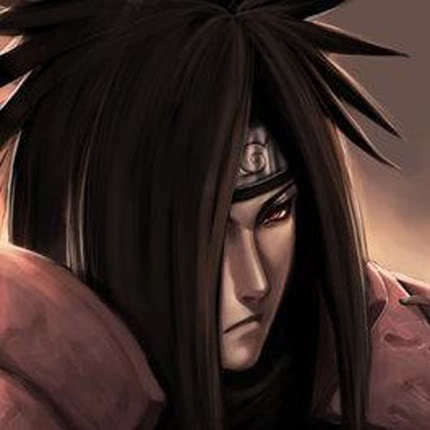 Madara exhibits a very calm and serious personality. He speaks with less formal diction, such as not using honorifics, and shows typically "villainous" arrogance. He speaks down to Pain (going as far as to refer to him as a "minion") and has great faith in his own abilities, only acting polite to Sasuke Uchiha. He will abandon his normal personality in favor of the Tobi personality when the situation calls for it, as he does when distracting a group of Konoha ninja. Madara has shown great ability in manipulating others to do his work for him. Minato believes that he is using Pain's ideology against him in order to control him. He, similarly, befriends Sasuke in order to get him to join Akatsuki by telling him about Itachi's past, even though he has an apparent interest in Sasuke and his abilities. While Akatsuki's goal to gain the tailed beasts is believed by most of the members to be a step in gaining control over the world, Madara implies that the real reason is to restore his Sharingan's power. U guys i Missed alot, didnt i? ANYWAY,HEY YALL! GIOVANNIMTZ IN DA HOUSE! BIG BONES AND BOOTYLICIOUS! *drag rusty and hidanfan back* me: no, you are not leaving! rusty, hidanfan dont leave plz!!!!! Me: sad! hidan:....me:...*galres at hidan again* hidan: stop that! 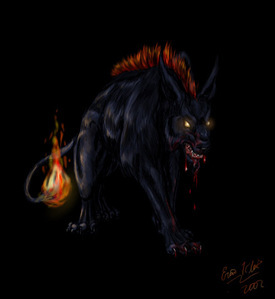 yea u did and my inner hellhound is still kinda angry...but im feeling less angry,and devious..
uhm, best bet 4 her survival..
ok... i edited it, so will you stay, hinata? no thanks... i'm a little better now..